Seventeen-year-old Haven Antonelli has never known freedom. From the time she was a little girl, she and her mother have been slaves; victims of human trafficking orchestrated by a vast Mafia network. But when Haven attempts to escape and is caught, one man gives her a choice: go with him or die. Agreeing to leave with Dr. Vincent DeMarco, Haven arrives at his home and meets the doctor's defiant - yet intriguing - son Carmine. Though Carmine privileged upbringing is a world away from hers, Haven senses the things they share. And soon her tenuous friendship with Carmine blossoms into an unexpected love. Carmine has breezed through life breaking every rule, scorning attachments; until he meets this strange, timid girl his father has brought home. Her innocence draws him in a way he cannot understand, and makes him feel in ways he never thought he'd experience. And when he learns the Mafia isn't through with her, he becomes bent on protecting her . . . no matter the cost. I don't even know where to begin. All I will say is, I absolutely LOVED Sempre. I cannot believe I have had this on my iPad for months and have not read it. This is a MUST READ!!!! While reading Sempre, I started to wonder could this possibly ever really happen. When I came up with the answer, YES, I felt sick to my stomach instantly. To know what this happens everyday was an eye opener. Haven lived a horrible life, until one day she was given a choice to live or die. When she chose to live, she never expected the life that she would end up with. Haven has never been given an opportunity to make a decision on her own. So when she went to live with Dr. Vincent DeMarco, Haven was given an opportunity at a new life. Carmine is Dr. DeMarco's son, whose eighteenth birthday is fast approaching. Not wanting his son to follow in the same footsteps as his father, Dr. DeMarco does everything possible to keep that life far from Carmine. But no matter how much he tries to protect his son from that lifestyle, it's knocking at his door. Carmine is a troubled teenager, who walks around with an attitude and has a horrible temper. After reading what Carmine has been through, it is understandable to see that his view of the world is jaded. Carmine may not have chosen to be born into the DeMarco family, but his name follows him and the enemies his father has earned are now Carmines's as well. Carmine never wanted to feel anything for anyone again after his life was shattered as a child. Carmine didn't know what it was about Haven that drew him to her. Haven didn't know how to take Carmine when she first met him. She was nervous around him and didn't feel comfortable being in the same room as him. Carmine, on the other hand, wanted to get to know Haven. There was just something about her that made him want to get to know her. As Carmine is introducing Haven to a new world, sharing all these new experiences with her, a new experience occurs for him. He's falling in love with Haven. Haven brings out the best in Carmine, and they seem to be healing each other from their pasts. When sparks fly between the two, many aren't happy with it. When Dr. DeMarco brought Haven to live with him, he stirred up a hornets nest. He uncovered information that he never knew existed. This is information affects his family; information that can get them all killed; information that got his wife killed. When danger comes knocking on the DeMarco's front door, and Haven is in danger, Carmine will do everything in his power to protect her. How far would you go to protect the ones that you love? Will Carmine chose the life that his father has been protecting him from? Will Dr. DeMarco protect Haven? Will Carmine and Haven make it through this alive? There are so many twists and turns in this book that I couldn't wait to see what unfolded next. I enjoyed this book from start to finish. I kept reading, waiting for the book to end, but it just kept going, making me want more. I am excited to start Sempre: Redemption and see what trouble the DeMarco's are getting into. I too read Sempre and couldn't believe how long it was sitting in my reader without even glancing at it. One day, I thought what the hell..so glad I did! 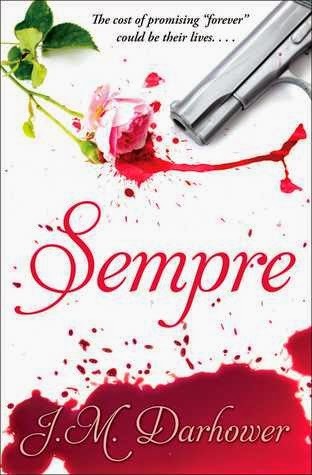 I loved all the ups and downs, and right now am reading Sempre: Redemption.